Two speeches by Fidel Castro on August 23rd and 24th 1968, attacking the "counter-revolutionary" anti-Stalinist movement in Czechoslovakia and supporting the USSR's invasion. To the dismay of the "Mandelite" Fourth International, which to this day venerates Che Guevara (who died in 1967), the Cuban regime put itself firmly in the camp of Russian imperialism fighting to crush the organs of democratic working-class power that had emerged in Czechoslovakia. August 23, 1968 - Excerpts from Cuban Premier Castro's speech in defense of Warsaw Pact intervention in Czechoslovakia are given below. 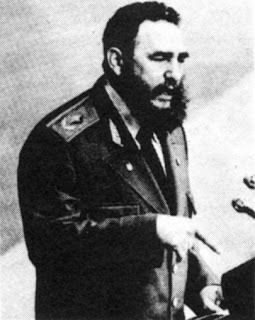 In his speech, Premier Castro criticized the Soviet leadership for not giving more aid to defeat the counter-revolution - in other countries as well as Czechoslovakia. But he did not, as some social democrats contend, give merely "critical support" to the action of the Red Armies. Right here, I wish to make the first important affirmation: we considered that Czechoslovakia was moving toward a counter-revolutionary situation. Toward capitalism and into the arms of imperialism. A real liberal fury was unleashed; a whole series of political slogans in favor of the formation of opposition parties began to develop, in favor of open anti-Marxist and anti-Leninist theses, such as the thesis that the Party should cease to play the role which the Party plays within socialist society and begin to play the role there of a guide, supervising some things but, above all, exerting a sort of spiritual leadership. In short, that the reins of power should cease to be in the hands of the Communist Party. The revision of certain fundamental postulates to the effect that a socialist regime is a transition regime from socialism to communism, a governmental form known as the dictatorship of the proletariat. This means a government where power is wielded in behalf of one class and against the former exploiting classes by virtue of which in a revolutionary process political rights, the right to carry on political activities -- whose objective is precisely to struggle against the essence and the raison d'etre of socialism - cannot be granted to the former exploiters. On many occasions the imperialists have publicly stated what their policy is in relation to the socialist countries of Eastern Europe. And in Congress, in the press, they always talk about encouraging the liberal tendencies and even about promoting, of making available, some selective economic aid and of using every means of contributing to creating an opposition to socialism there. The imperialists are carrying out a campaign, not only in Czechoslovakia, but in all the countries of Eastern Europe, even in the Soviet Union. the socialist bloc has the right to prevent it in one way or another. against injustices and are so highly regarded in the world? Czechoslovakia from the community of socialist countries? prevent such a situation from occurring? What would have remained of the communist consciousness of this people? of the dignity of this people, of the revolutionary morale of this people? the revolution if such circumstances should one day arise? by asking aid of allied armies. having to do such a thing to save it? legally, our people are concerned with an explanation of these concepts. Such things are not in our idea of the revolution. situation and this was seriously affecting the entire socialist community. were saying, recognizing that and nothing else is simply enough. The SWP in the US, abandoned Trotskyism, to become Fidelista. What is interesting about them, is that you are not allowed to be a member, unless you work in basic industry. I disagree with using the word imperialist, to described Russia in that period.